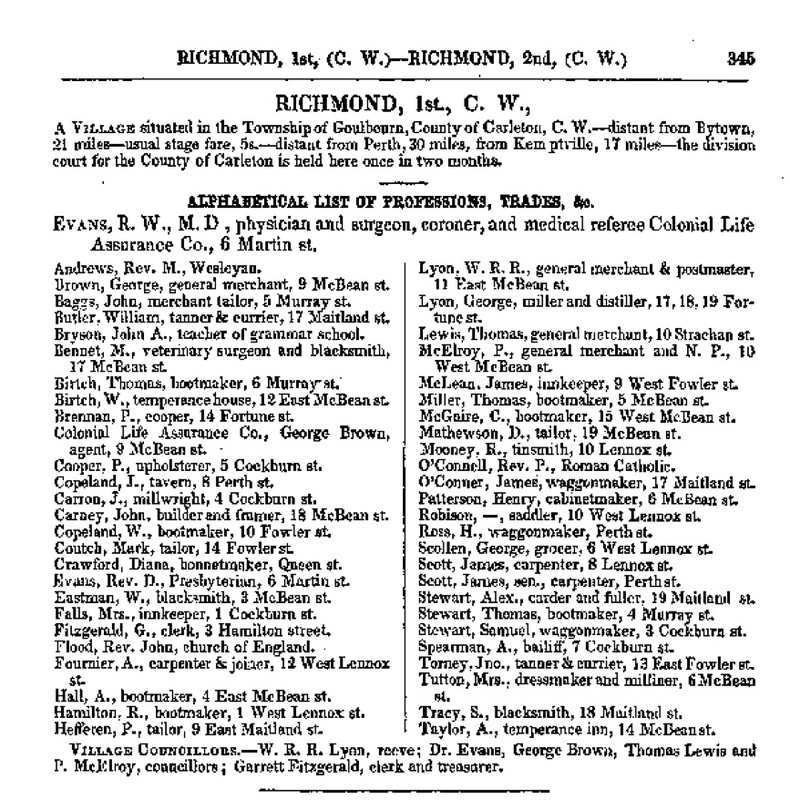 The 1851 “Province of Canada Directory”, which can be found in the Library and Archives Canada collection, provides us with a snapshot of the professional and trades people active in Richmond. 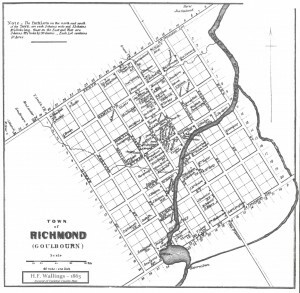 The Directory distinguishes between two Richmond Villages in Canada West. Richmond #1 is our village in Carleton County while Richmond #2 is located in Middlesex County, 7 miles from Aylmer and 37 from London. Robert W. S. Mackay and his assistants compiled the Directory, which provides good information but also raises many questions. Here are some examples. There is much debate as to the location of the Masonic Arms Hotel operated by Maria and Andrew Hill. Research seems to indicate that it was located on Strachan St. at or near the corner of McBean St. Some years after Andrew’s death in 1830, Mrs. Hill married Andrew Taylor and according to the 1851 census they were living in a frame house and Andrew was a farmer. This Directory lists him as the proprietor of a “temperance inn” on lot 14 McBean St. This is the site of the smokehouse. Was this a new enterprise OR was the Masonic Arms renamed and had it been at this location (south of the Jock River) all along? Only more research can answer this question. Although 12 years later, the landscape was much the same in 1863. The 3 buildings of George Lyons’ Estate on the lower left corner are lots 18 & 19 of Maitland St.
3 blocks east are the tradesmen on McBean. There seems to be a commercial centre south of the Jock River. 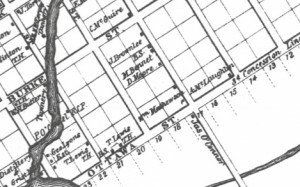 George Lyon had a mill at the dam he constructed on the Jock River at the convergence of Ottawa St. and Maitland/Fortune Streets. It seems that small businesses grew up east of that area & those on lots 17, 18 & 19 Maitland were on land owned by Mr. Lyon. Among the tradesmen were James O’Connor, waggonmaker, 17 Maitland St. (O’Connor bought land and moved his business to the Park lot on the west side of McBean Street at the intersection of Ottawa St. in 1855); S. Tracy, blacksmith, 18 Maitland St.; and Alex Stewart, carder and fuller, 19 Maitland St. Three blocks further east on McBean St. were three more tradesmen: C. McGuire, bootmaker at 15 McBean St.; John Carney, builder and framer, 18 McBean St.; and D. Mathewson, tailor, 19 McBean St. The Directory provides the earliest source we have uncovered which details this area. Most addresses correspond to lot numbers (which are numbered north to south along each street), but there are some exceptions. Where were 6 Martin St. and 10 Strachan St.? There are no lots carrying the names of these streets. In the introduction to the volume, the author states that only subscribers have their names capitalized. Thus it appears that Dr. Evans is the only subscriber from Richmond. We thought it might be informative to compare the Directory entries with those on the 1851 census (which was not actually completed until 1852). Below is a transcription of the Directory with the census data in brackets after each entry. In the census data, a person’s name is followed by their occupation, age and type of residence). When work shops or stores are named, it is not clear if they were attached to the house. Following the transcription of the data, is a copy of the original Directory Entry and at the end of the article you will find links to online versions of both the Directory and Census. A Village situated in the Township of Goulbourn, County of Carleton, C.W. – distant from Bytown, 21 miles – usual stage fare, 5s – distant from Perth, 30 miles, from Kemptville, 17 miles, – the division court for the County of Carleton is held here once in two months. Alphabetical List of professions, Trades etc. Colonial Life Assurance Co., George Brown, agent 9 McBean st.
Wallings, H. F. “Richmond” Excerpt of Carleton County Map. 1863. in Goulbourn Township Historical Society Map Collection. This entry was posted in Locations, Personalities and tagged commercial, Directory, Industry. Bookmark the permalink.